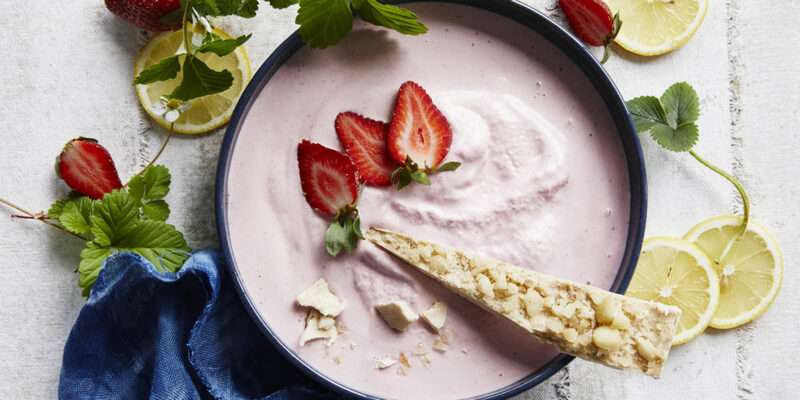 The beauty of this smoothie bowl? It legit tastes like strawberry cheesecake! 1/4 cup almond milk, or milk of choice. 2 tablespoons full-fat plain or Greek yoghurt. 1/2 lemon, juice and zest. 2 tablespoons vanilla protein powder. 2 pieces Vanilla Crunch Protein Bark. 1. Place all ingredients into a high-speed blender and blitz on high until smooth. Divide mixture between two bowls. Top with Vanilla Crunch Protein Bark, strawberries and lemon zest to serve. Check out our Super Smoothies Cookbook for our recipe for Vanilla Crunch Protein Bark!